Pustak Ka Vivaran : ashok ke abhilekhakon ke nae sanskaran aur adhyayan ke lie kshama yaachana kee aavashyakata nahin hai. ye abhilekh bhaarateey itihaas aur sanskrt ke mahatvapoorn strot hai. vishayagat mahattv ke saath saath inakee bhaasha aur shaileegat anishchitata ke kaaran inakee gambheerata aur badh jaatee hai. inake utarottar pun paarthan, sampaadan…………. 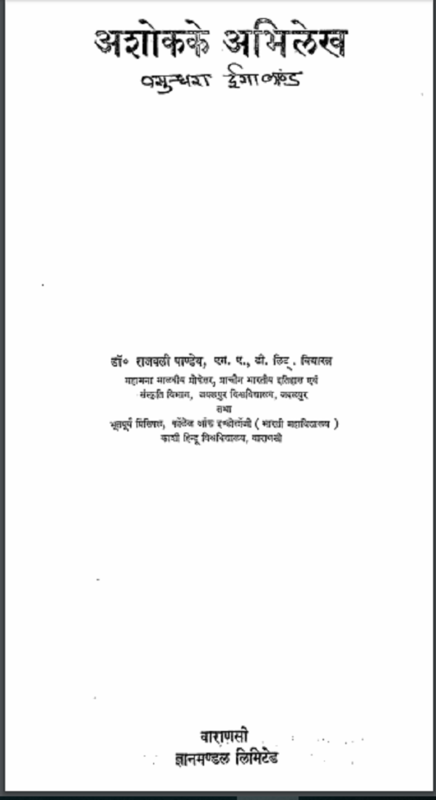 Description about eBook : Ashok writers do not need apologies for new versions and studies. These records are important sources of Indian history and Sanskrit. Along with thematic importance, their language and stylistic uncertainty increase their severity. Their subsequent re-creation, editing……………..